I found the sound quality of 'Hall' not as good as other Hawkwind discs I have bought. Seren, you're right about Hall. I have the box set and it sounds like a copy of a cassette. But the rest of the box sounds great. Phobos, I think you're the only one here who has mentioned Type O Negative, in my top five all-time bands. Miss these guys so much after Peter's death and subsequent/inevitable end of their career. Won't be anyone like them probably ever. [Phobos, I think you're the only one here who has mentioned Type O Negative, in my top five all-time bands. Miss these guys so much after Peter's death and subsequent/inevitable end of their career. Won't be anyone like them probably ever. Type O Negative were a great band, and had some really brilliant songs, and also some of their cover versions are outstanding, for example their version of Black Sabbaths Paranoid takes the song to a whole new level. As disappointing as it is I am kind of happy that they are not going to carry on, unlike some other bands I could mention, as that in my opinion would have been disrespectfull to Pete, after all Pete was Type O Negative. Well yeah he wrote all the songs so when Peter died TON died. I think Kenny Hickey is an amazing guitarist, too. Mick Chillage--Infinite Perspectives. His latest solo release on txt label. Excellent. Big and symphonic/cinematic sounds. Modern electronic classical? I don't mean violins and stuff. But if Richard Wagner had synths at his disposal back then, it may have come out like this. Chillage output now is very prolific. You might say he's filling the legacy of Pete Namlook, whose influence is huge on his music. Another Chillage disc that would have been a great Fax release. This should win a prize for the most creative ambient album of the year: Gangster rap meets electronic ambient. At first I thought this was a joke, but it isn't; it is absolutely fantastic. The album begins with a gun shot, the sound of which is suspended in time as electronic meanderings spiral into the scene. The rest of the album builds on that atmosphere, with a smattering of processed police radios, occasional beats, a distant turntable sample, and lots of beautiful textures. and a fair bit of Classic FM on the car radio. Enjoying it very much, can't beat a bit of chilled out Classical whilst driving. Awesome acoustic-ambient 3CD set from Junya Yanagidaira and Yu Isobe, featuring a wide array of guest musicians. This will be of interest to folks who enjoy the intersection of ambient and modern composition. Lovely cover too. I guess this is what folks call "ritual ambient" or something but I'm not sure. Not usually my thing, but I like this. Quite aggressive in places, sounds are all acoustic instruments including horns made of bone. 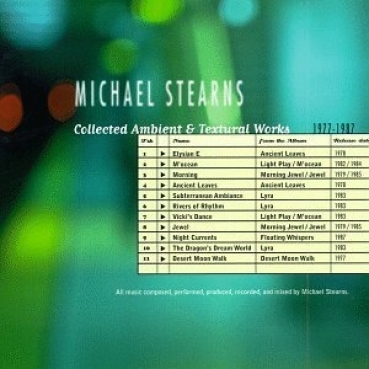 Michael Stearns - Collected Ambient and Textural Works. Excellent. Away to check out - Of Earth and Sun. Solid ambient + drones from Kranky. Lots of orchestral work on here, with some mysterious moods and atmospheres. -played twice yesterday, really like this one. -picked up during the SP $5 sale. Very good album, minimal, but with moments of activity. -quite primitive by today's standards but I dig this sort of thing. -sort of wrote off this group years ago, as I only liked their side projects like Slim Westerns or the Schutze/Hulme collaboration CD. This album is very good though. The group really needs to get some sort of site with lossless downloads going, only mp3s and compressed files appear to be available. This is the new release by AoC. It is still "in press", but is available digitally. Great stuff: sequenced structures and vast ambient washes. AoC's own description notes that the album was largely improvised. I suspect that if Mick and Lee were to simply smash their faces on their equipment that the result would nonetheless move me to tears. Thanks for the head's up, thirdsystem.